Climate change is caused by the greenhouse effect, a natural process that warms the Earth’s surface and atmosphere. As energy from the sun reaches the atmosphere, some of it is reflected back to space. Greenhouse gases in the atmosphere absorb and re-radiate the rest. These gases, such as water vapour, carbon dioxide, methane and nitrous oxide, act like a greenhouse by trapping heat in the atmosphere, maintaining Earth’s temperature and sustaining life. Human activities - including burning fossil fuels (coal, oil and natural gas) and removing trees (which naturally take up carbon dioxide from the atmosphere) for agriculture and development - generate more greenhouse gases. This ‘enhanced greenhouse effect’ can increase the Earth’s surface temperature. Many tourism activities accelerate global warming, making it important for us as an industry find ways to minimise our impacts. Pumpkin Island’s management is committed to reducing the impact of its activities, services and products on climate change by reducing the carbon footprint of the island as well as offsetting its carbon emissions to become a beyond carbon neutral destination. Avoiding deforestation in the Amazon rainforest (VCS). We encourage staff to present our commitment to environmental and social sustainability and our benchmarked/certified status under the Ecotourism Program to our guests, suppliers, contractors, agents and wholesalers via email, website and verbal communications. The staff and management of Pumpkin Island are fully committed to operate as sustainable an operation as possible, saving and improving usage of water, power, fuel and emissions and thus minimising their environmental footprint. Pumpkin Island was awarded the Advance Eco Tourism certification in November 2009 and have been accessed and certified by EarthCheck in February 2011. 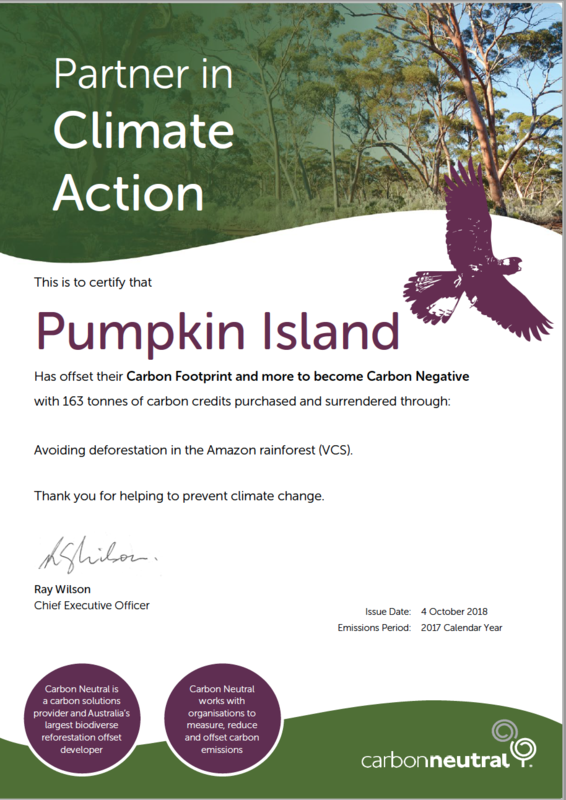 Pumpkin Island was certified as a Climate Action Leader in March 2011. In all ways, Pumpkin Island endeavours to maximise the positive social and environmental impacts of it’s operations and to minimise the negative social and environmental impacts. Pumpkin Island strives to promote meaningful responsible travel to a pristine natural area which conserves the environment and it’s resources and improves the welfare of it’s visitors by being in close contact with nature. To promote an enriching and enlightening experience of living, working and playing harmoniously with nature, underlining the importance of conserving, protecting and educating, thereby enabling our guests to implement small changes into their daily lives by example. Reducing the island’s carbon footprint as much as possible is one of the primary goals the island is working towards. Reductions that result from transporting as little as possible goods over long distances, reducing transfers to a few scheduled days a week, reducing waste to landfill and turning off all gas outlets unless used is as important as the sourcing of products from local communities. Chemical free organic options result in a more wholesome experience. Keeping guests informed of these initiatives teaches them how to reflect the philosophy into their own lives, and how these intelligent alternatives benefits them individually, and our planet as a whole. We display fairness and integrity, and foster mutual trust and care in our dealings with our employees, our business partners and our guests. We try to deal with others as we would want them to deal with us, and others. We foster the development of all our employees; we respect each other's contribution and importance. We are continuously evolving and striving to better ourselves through a passion for self-improvement and learning. We create a sense of pride and a feeling of "ownership" amongst our hosts and each host strides to own and immediately resolve guest problems. We are in harmony with the environment and our cultural surroundings. We contribute our resources, both financial and human to help better the environment and the community, which we live in. We create a work environment of teamwork and imaginative service so that the needs of our guests and each other are met. We are involved in the planning of the work that affects us. We believe in Intelligent Luxury, Innovative Style, Redefining Experiences and Balancing Senses. We maintain a good standard of personal health as a duty to ourselves so that we may be of service to others, We encourage our family, friends and colleague to do likewise. We aim to minimise the consumption of energy and water, reduce the generation of waste. To be trendsetting and innovative and continue to redefine a responsible leisure lifestyle.